I have one spare sweet potato and the spices on hand. Free apples from the Christmas basket at work- FREE CANDY!!! SUPER ! 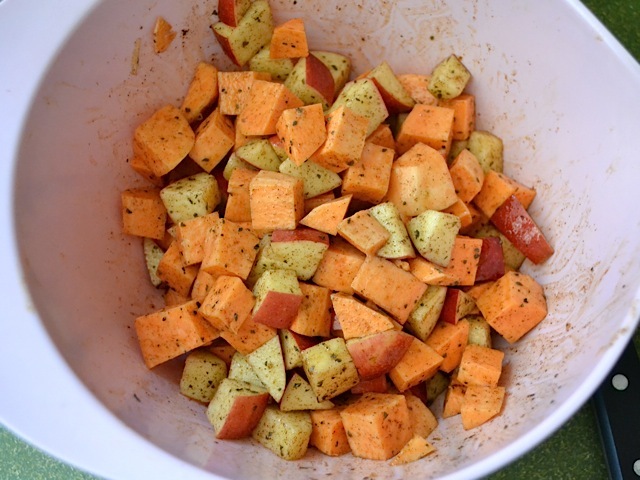 I’ve been using baked sweet potato, cutting into cubes, and “cooked” apples (cut into cubes and cooked down in skillet) Then I just mix the two…and I add cut up avocado. Mine is mushier, but good. I add tiny bit of cinnamon and nutmeg. 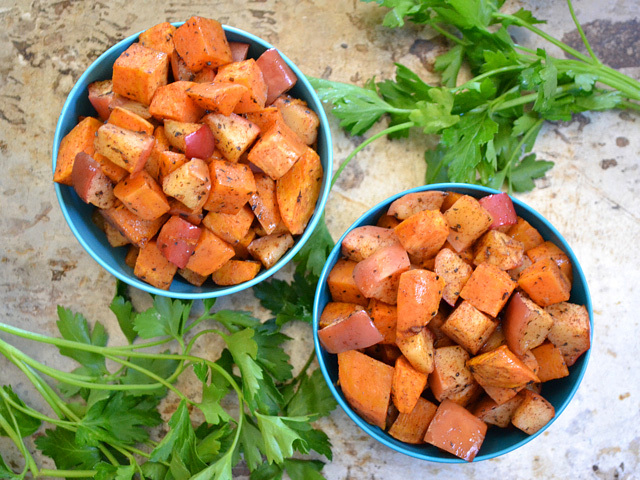 I’m gonna try your recipe for Thanksgiving dinner as my Sweet Potato Dish…It is much prettier to look at than my mush…lol. I just made a batch exactly as specified in the recipe, and OMFG, it is amazing. No tweaks or adjustments needed. 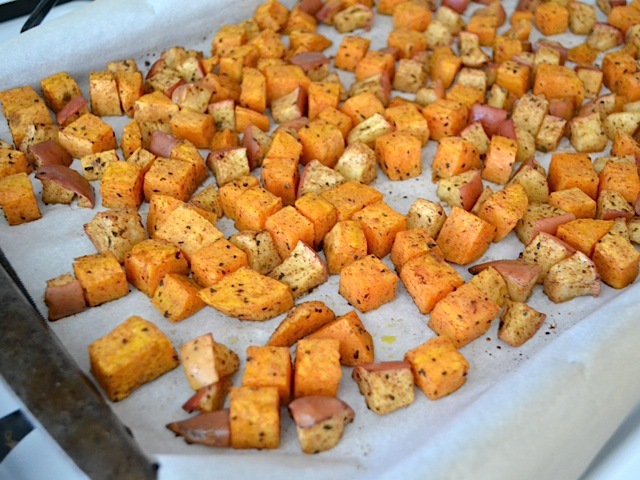 This was okay; I love roasted sweet potatoes but imo the apples need to be added just during the last few minutes, and it does benefit from a sprinkling of salt. Hmm, what if I put in dried oregano instead of dried basil? Or, what if I put in Thai basil (not dried) instead? I think all of those options would be delicious! This is a great snack! 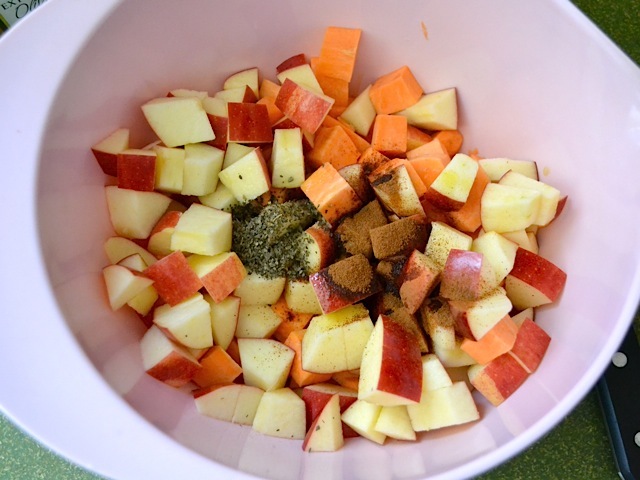 The only change I made was that I roasted only the sweet potatoes, not the apples, because I didn’t want the apples to be warm and mushy. 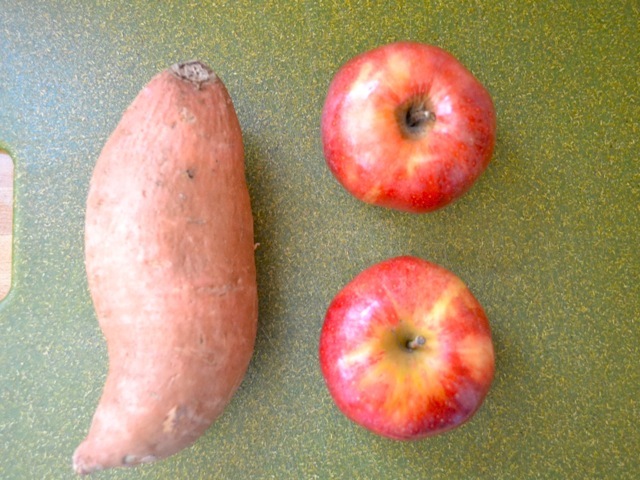 The contrast of the soft sweet potato and the crispy apple was lovely. Okay, so it just came out of the oven, and holy BALLS, this stuff is good. And I generally don’t like sweet potatoes. 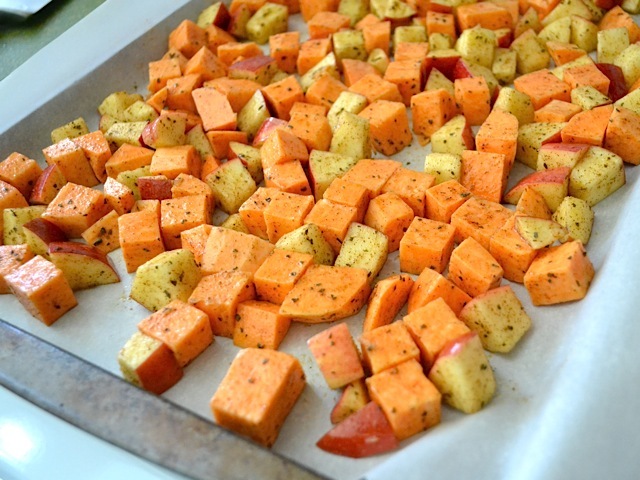 Based on this mix, which I LOVE, I can only come to the conclusion that all the sweet potatoes I have eaten have been overly sweetened (to be fair, most of them were in holiday casseroles). I only had Granny Smith apples, so I added a cup of golden raisins and just a little bit of sugar to compensate and it is GREAT. 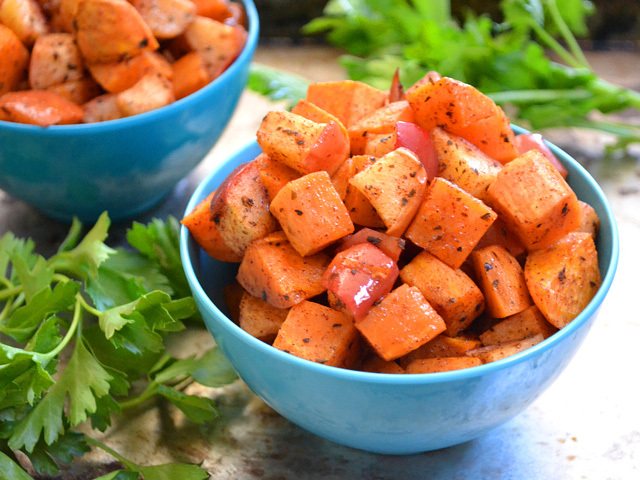 Now I wish I had more sweet potatoes (I’m surprised I even had the one that was in my fridge). Beth, help a sista out. :) If I didn’t have basil, is there anything else i could use in place of? All purpose seasoning… italian seasoning… ?? Hmmm, I don’t know that there’s another herb that would blend quite as well as basil does here, but it would still be super fantastic without the basil. 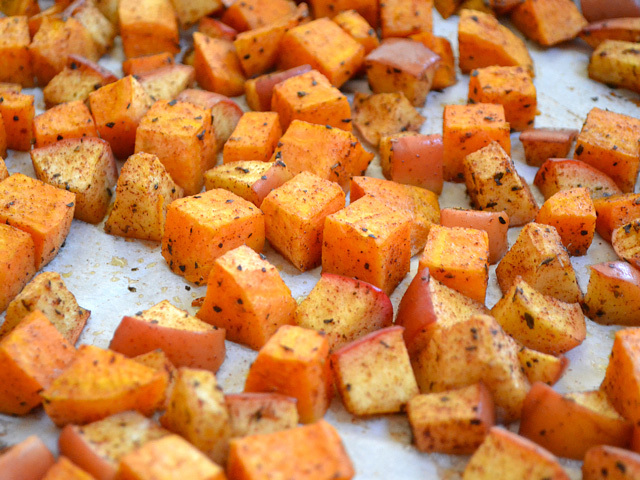 The roasting process is what makes it so amazing and that little touch of cinnamon really adds a lot. I think the basil is more in the background. This looks delicious. I want to make it when a friend comes over for dinner this week, but I’m not sure what to pair it with. Did you serve this alongside anything? Any recommendations? SO DELICIOUS!!! I added a sprinkling of sea salt! It was really really good! Just got back from the grocery store and its in the oven, I can’t wait….